Cheryl’s recipe relies on agave nectar to sweeten it, while Melissa’s uses maple syrup and a little brown sugar. Agave has a lower glycemic index than other sweeteners and packs a sweeter punch, so you use a bit less. I’ve made granola with maple syrup, though, with wonderful results. For the oil, Cheryl uses canola, while Melissa uses olive oil in the NY Times version and coconut oil (an expensive but healthy alternative) in her Cook This Now version. 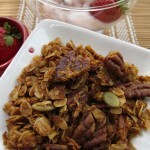 Both also use dried coconut, in addition to the oats and other seeds, nuts, and dried fruit. I’ve made granola with and without coconut – satisfying either way – depends on your personal relationship with the multi-talented tropical fruit. But be careful about using sweetened vs. unsweetened. If you use sweetened coconut, you’ll need to cut down on the sweetener in the granola. Preheat oven to 325 degrees, or 300 convect. Have two sheet pans ready, lined with silicone mats or parchment paper (optional). In a smaller bowl, stir together the oil, agave nectar, vanilla and almond extract. Add this mixture to the larger bowl and combine well. Eat alone as a snack, top your favorite yogurt, add bananas, strawberries, and milk or sprinkle on your favorite frozen yogurt or ice cream.